Facts and history about the life and lifestyles of Native American Indians. What did Native Americans eat? The food eaten by Native American Indians varied from tribe to tribe and was obtained from the natural resources such as meat and fish that were available in their different locations or from the crops that were raised by the agriculturalists. The protein foods and cultivated crops were supplemented by wild vegetables, seeds, grains and nuts, fruits and berries. Maize, or Indian corn, was one of the principal sources of food for many tribes and together with the staple crops of beans and squash are commonly referred to as the 'Three Sisters'. Native American Food Fact 5: When foods was scarce the tribes of the Great Plains ate dried buffalo meat, called pemmican. Native American Food Fact 7: Many Californian tribes such as the Chumash and the Maidu included a staple diet of acorns. The acorns were roasted, eaten whole or ground into acorn meal which was used to make bread. 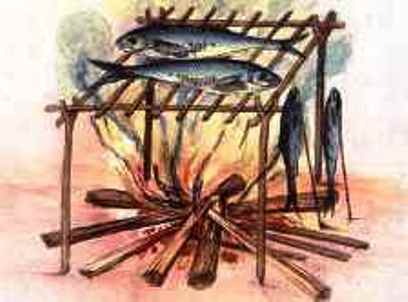 Coastal and river tribes ate a variety of fish and shellfish including salmon, eels, trout, clams and crabs.